Some were surprised when Ben Sheets signed a lucrative one-year deal with the Oakland Athletics. Sheets missed the entire 2009 season with an elbow injury. And the A’s generally don’t hand out $10 million dollar contracts. So far, the results have not been what either party was hoping for. Sheets is just 2-3 after 10 starts. He is averaging less than six innings per outing and his ERA sits at 5.04. According to FIP (fielding independent pitching) and xFIP (expected fielding independent pitching), metrics that quantify factors a pitcher can control (including walks, strikeouts, and to some extent, home runs) there is nothing to suggest he has been outrageously unlucky. His 4.66 FIP and 4.69 xFIP are only slightly lower than his ERA. In terms of strikeouts and home runs allowed, Sheets is near career norms. His strikeouts per nine innings rate (K/9) of 7.32 is near his career number of 7.59. His home runs per nine (HR/9) is up slightly to 1.14, but not too far from his career 1.01 HR/9. The bulk of Sheets’ early-season struggles have come in the form of bases on balls. Throughout his big league career, Sheets has kept his walks to a minimum. His career walks per nine innings (BB/9) is a wonderful 2.07. In fact, from 2003 to 2006, his BB/9 was just 1.35 over 720.1 innings, a truly elite level. In 2010, he has lost control. As it stands, his 2010 BB/9 is a career high 4.55. Here are some numbers to consider. In 2004, he walked 32 batters in 237 innings. In 2005, he walked 25 in 156.2 innings. He has walked 28 batters in 55 innings already this season. Overall, Sheets has been disappointing, however, there are some signs of improvement. His May ERA of 5.08 is higher than his April ERA of 5.00, but his FIP and xFIP for the month of May have dropped to 4.25 and 4.05 respectively. Walks remain a problem (4.45 BB/9 in May), but his strikeouts have increased. After striking out 14 batters in 27 innings in April (4.67 K/9), Sheets has struck out 31 batters in 28 May innings (9.85 K/9). 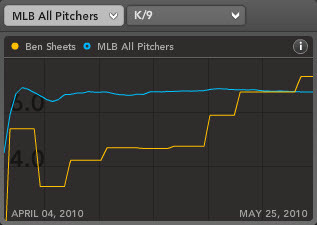 Looking at pitch selection data, it seems Sheets improved K rates come with a change in pitches thrown. Sheets is throwing more change-ups now, and generating a lot more whiffs on his curveball. There was some talk of Sheets tipping his curve earlier this season, but it looks like he is back to fooling batters with it. Even though his strikeouts are rising, the walks are still a concern. In addition to the free passes, his average fastball in 2010 of 91.3 miles per hour is about a mile and a half slower than his career average of 92.6 MPH. If the A’s are not in playoff position come July 31st, Sheets will be a primary trade target for American League and National League teams alike. If you own Sheets in an AL-only league, consider floating his name in trades now – saving yourself the worries of the what-if’s later. For more on Ben Sheets and possible trade candidates check out Bloomberg Sports’ Fantasy Tools.